The Color Pop Acrylic Canisters are affordable and adorable – a winning combination! Dry food such as crackers, flour or pasta is kept fresh thanks to the airtight seal. 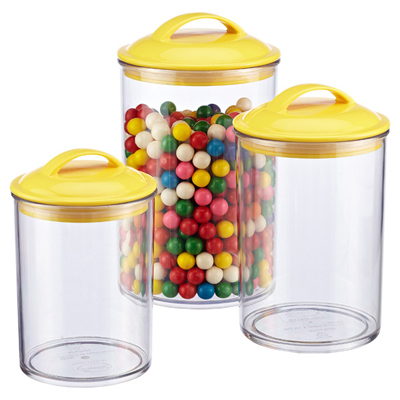 The brightly colored lids offer a pop of fun to your kitchen countertop, pantry or cabinets. $8.99-$14.99. Buy here . 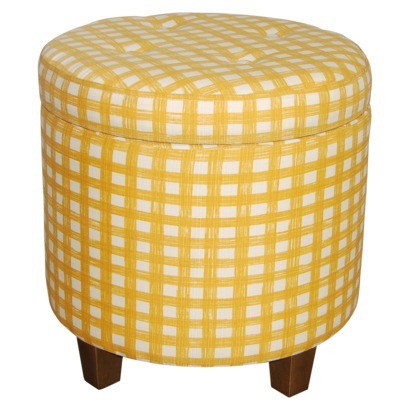 The Round Tufted Storage Ottoman in gold is a great piece for any space. Charming and attractive, use it for a foot rest or extra seating, and put extra blankets, pillows or games in the storage space. $59.99. Buy here.